To review a man's account - and to some extent, inevitably, an assessment - of his own life is an act not to be undertaken lightly, especially when it is disclosed that the account "was not initially intended for publication". I have taken this on board partly because I spent the last years of my "colonial" career on de Bunsen's staff at Makerere (though not directly employed by Makerere, being seconded from the Colonial Administrative Service), and partly because my own non-academic background was in such contrast to the author's, thereby allowing perhaps a more impartial assessment of his undoubted achievements. This autobiography - it is no less despite a disclaimer in the Introduction - embraces the subject's upbringing and career up to retirement in England. Half the book is devoted to his work in East Africa; as Principal of Makerere for 15 years and three years as Vice- Chancellor of the emerging Federal University of East Africa. His greatest achievement was undoubtedly the development of Makerere from a national college (which had started life a quarter of a century earlier as a Technical School), a centre of Higher Education for Kenya, Tanganyika and Uganda, to a national degree-awarding University with four times the numbers of staff and students. 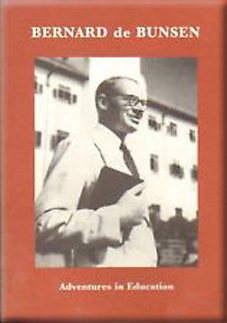 As the author of the Book's introduction says, Makerere was the "centre-piece and climax of de Bunsen's career". His achievement was all the more remarkable in that he had no prior experience of University administration other than as an undergraduate of Balliol College, Oxford. He acknowledges, only by inference, the silver spoon with which he was born although he does not seem to recognise some of the undoubted concomitant outcomes. Thus, "Why I went to Oxford, and not to Trinity, Cambridge, with which we had so many family connections, I am not sure. And why to Balliol? Maybe it was my headmaster, Charles Evans, who prompted it, though Gilbert Murray had suggested to Mother ( "Mummy" elsewhere throughout) that I should go to Oriel whose venerable President, Phelps, said they would be 'glad to have another de Bunsen' And why not indeed? His paternal great-grandfather had been Prussian Minister to the Court of St. James; his grandfather had been Liberal leader in the Reichstag. De Bunsen had schooled in Switzerland and England (at a Quaker school to whose ethos he had been "constantly drawn", although "unable to accept in its totality the Quaker faith of pacifism"). He was, exceptionally, allowed a fourth year at Balliol in order to graduate. He refers to himself as a committed Socialist and developed and practised a lively social conscience throughout his life. Just before the outbreak of WWII he joined his Quaker uncle Charley on a quixotic visit to Germany seeking to prevent war. His uncle met, to no avail, both Hess and Himmler and he visited an English cousin, Hilda, married to a Bismarck. He spent the war as a member of the Schools Inspectorate and did his share of air raid warden duties in Sheffield where he found that "crises, even destruction, can release one". At the end of the war, for a brief period he became "an un-uniformed Lt. Col." inspecting education establishments of the Army and RAF in Germany. Principal resigned and the Vice-Principal was due to leave on retirement. Once again he found himself pitchforked upwards - as Principal (acting, to start with), a post in Administration "which only a year before (he had) deliberately quitted for teaching''. The rest is history, recounted from a personal viewpoint which complements admirably the earlier (1964) history of Makerere, Margaret Macpherson's Chronicle of Makerere University College 1922 to 1962 (CUP). As de Bunsen endearingly writes, "I kept pinching my unacademic self, so improbably translated from the Elementary Schools of Liverpool and Sheffield and Palestine into the Principalship of a University in the making in Africa''. He met with much opposition, especially in arranging the special relationship with the University of London (opposed inter alios by his former Master of Balliol, the redoubtable A.D. Lindsay). I would question his conclusion that "without this Makerere generation, the East African countries could hardly have won or sustained their Independence". There was sadness attached to de Bunsen's departure from the African scene. He had happily handed over to a Ugandan the Principalship of Makerere when he assumed the Vice-Chancellorship of the new Federal University. He was asked at the end of his two year appointment, by the representatives of Kenya and Tanganyika on the new University council, to stay on. But, alas, not by Uganda's representative. Despite pressure from Kenya and Tanganyika to stay, de Bunsen felt retirement was the only way out of the impasse. Throughout the book de Bunsen is generous in his tributes to colleagues and others for their contribution towards Makerere's progress to full University status and onward as part of a Federal University of East Africa - however short-lived ("a last minute legacy of the Colonial regime which . . . . fell apart after eight years"). He speaks highly of the first Registrar, Lindsay Young, from whom your reviewer took over briefly when Young went on leave soon after his appointment and handed over the complete files of the university in two cardboard Nestle milk cartons. There emerges from the well produced pages of this book a portrait of an honourable and upright man devoted to the causes he undertook and wholly uncorrupted by the many successes and happily few failures of his career. Your reviewer last visited Makerere at the height (or depth, rather) of Amin's misrule. The infrastructure and services on the 'Hill' had all but disappeared but there were students and staff working on still recognised degree courses. De Bunsen's contribution to that survival stands out clearly from this publication. He and his wife, whom he married in 1975 after retirement, must have been much comforted by the warmth of their reception when, at the invitation of the University Senate, he remmed to give the Foundation Address.